We’d love your help. Let us know what’s wrong with this preview of Spring Skies Over Bluebell Castle by Sarah Bennett. To ask other readers questions about Spring Skies Over Bluebell Castle, please sign up. There is something so magical about a castle, especially for an American like myself. The fact that people actually live in Castles still is so foreign to me, it is the stuff of dreams! Add in a handsome charming castle owner, A cast of fantastic secondary characters, and a bit of a mystery... and you’ve got yourself one Fantabulous story! Sarah Bennett’s words are simply beautiful and full of whimsy and delight! Lucy needs an escape from the A charming love story sprinkled with warmth and wit! I don't know which castle inspired this novel, but it sounds amazing. You can call me biased since I have a castle crush with its memories and unwritten histories and well, finding a hidden treasure is everyone's childhood dream. Sadly, there are not many secret tunnels left to unearth anymore, and so, even though the novel is a tad bit unrealistic, it fulfils every romantic's dream. The book offers a very light and enjoyable read with one of the perfect happy endings. The castle and its beauti I don't know which castle inspired this novel, but it sounds amazing. You can call me biased since I have a castle crush with its memories and unwritten histories and well, finding a hidden treasure is everyone's childhood dream. Sadly, there are not many secret tunnels left to unearth anymore, and so, even though the novel is a tad bit unrealistic, it fulfils every romantic's dream. The book offers a very light and enjoyable read with one of the perfect happy endings. The castle and its beautiful scenery come alive through Bennett's mesmerising diction and I so wish it were all real . . . you could have always counted me as the permanent visitor there. As for the characters, we get a dual point of view through Lucie and Arthur and for my part I favoured Lucie. She has a vulnerability in her that invites our protective instincts. In spite of the dent in her confidence, she is honest and honourable, a virtue that is difficult to encounter these days. 5☆ Light Hearted Romance, Dash of Mystery and Intrigue! Spring Skies over Bluebell Castle is a Light hearted fun, story, with a dash of Mystery, intrigue and romance. Oh and I have to mention... just how wonderful the cover is! Arthur, Tristan and Iggy are triplets. They all live in Bluebell Castle. After some misfortune they have found themselves with money troubles, and are trying to work out how best to save their home. Lucie finds herself heading to Bluebell Castle to work. After a really rough 5☆ Light Hearted Romance, Dash of Mystery and Intrigue! Lucie finds herself heading to Bluebell Castle to work. After a really rough patch at her previous job, she decides to take on a short term job helping out at the castle evaluating it's assets and worth. To see if there are any hidden treasures, they can sell to help save Bluebell. It was wonderful to see Lucie's commitment and passion she had for her job, and her dedication to help them save the castle. She hasn't had it easy, her past haunts her, so getting this lucky break and finding a purpose really helped her. But what shone was Arthur and Lucie's budding romance, as they try to fight their feelings. 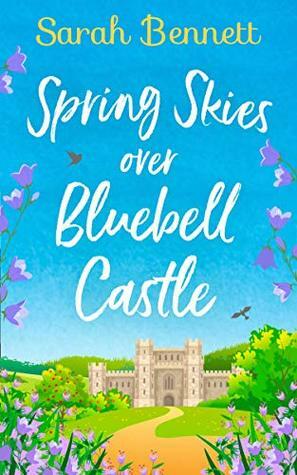 Spring Skies over Bluebell Castle was such an entertaining, light hearted read, the characters were a great mix, the romance swooned along nicely, there was a lovely historical undertone. I really enjoyed the subtle mystery and intrigue that helped set the scene nicely. I am really excited about this new series and can't wait to read the next instalment! Spring Skies over Bluebell Castle is another Gem of a series! I loved the history of Bluebell Castle. At times it felt like I was in another era with characters names like Arthur and Lancelot. I was almost waiting for the knights of the round table to turn up! I think it makes this story almost magical at times and was certainly spellbinding as I w Lucie is a lady whose past she can’t seem to out run. No matter where she goes she is always reminded of it and struggles to escape it. Bluebell Castle seems to be the perfect opportunity to start a fresh though. I've not read this author before, and this book was a lovely enjoyable read. the only down side was the ending...but as the saying goes you can't have everything. This is a lovely, contemporary story with nobility, mystery, suspense and romance interwoven into a delightful book to escape into. It also has historical elements as the diaries of ancestors and artefacts and works of art they purchased are important elements in the events as they search for valuables that might help fund the restoration and maintenance of the castle. Lucie Kennington is an art specialist at an auction house and loves her job. She's made an amazing discovery but when it is repla This is a lovely, contemporary story with nobility, mystery, suspense and romance interwoven into a delightful book to escape into. It also has historical elements as the diaries of ancestors and artefacts and works of art they purchased are important elements in the events as they search for valuables that might help fund the restoration and maintenance of the castle. Lucie Kennington is an art specialist at an auction house and loves her job. She's made an amazing discovery but when it is replaced by a fake, this leads to accusations, suspension and the suggestion that she's emulating her father. Disheartened, Lucie's Mum convinces her to apply for a two month post evaluating the contents of Bluebell Castle in Derbyshire. It is there that she meets the Ludworth triplets - Arthur, Tristan and Igraine (who prefers to be known as Iggy). When you learn that their Uncle is Lancelot you'll probably gather there's a family fascination with the stories of King Arthur and the Knights of the Round Table . . . . they even have their own Round Table in the main Hall as well as other artefacts relating to the legend! Living in a castle must be like a dream come true, right? Well, wrong. Often castles are money eating things and dreams are often turned into nightmares thanks to decisions made by previous heirs. As much as I hate to burst your bubble, living in a castle is not a bed of roses or should I say bluebells? 😉 But sometimes you only need that one stroke of luck to turn everything around. When you see the cover, you just wish you could be teleported there. It shouts romance and that’s indeed one of the Living in a castle must be like a dream come true, right? Well, wrong. Often castles are money eating things and dreams are often turned into nightmares thanks to decisions made by previous heirs. When you see the cover, you just wish you could be teleported there. It shouts romance and that’s indeed one of the things you will get. Besides you will also be amused by the little jokes and funny situations and a bit teary-eyed at times as well. The author stole my heart by making the Ludworth family such a big dog lovers. I would not mind living there surrounded by all those furry treasures. It’s a fluently written, very enjoyable story and in my opinion a superb start of a new series. I, for sure, can hardly wait to pack my bags and return to Bluebell Castle. 4 stars. Thank you, Sarah Bennett and Rachel’s Random Resources. I did enjoy this it was a light easy read, but for me it couldn’t quite keep me as interested as I would like. It was predictable and I couldn’t quite care about the characters they seemed to lack chemistry. Enjoyable but not my favourite read of these books. I must say that I really enjoyed this book and am saddened that I have to wait to find out what is next for the Ludworth family. Lucie Kennington is an art specialist at a well known and respected auction house. She loves her job and has just made an amazing discovery of a painting that had been hidden during WWII. When the painting is replaced with a reproduction, she is suspended from her job, accused of fraud. The head of security has been informed of her father's history of embezzling from c I must say that I really enjoyed this book and am saddened that I have to wait to find out what is next for the Ludworth family. Lucie Kennington is an art specialist at a well known and respected auction house. She loves her job and has just made an amazing discovery of a painting that had been hidden during WWII. When the painting is replaced with a reproduction, she is suspended from her job, accused of fraud. The head of security has been informed of her father's history of embezzling from clients and imprisoned, where he died. The comment of "Like father, like daughter" is never spoken, but that is what Lucie hears in her mind. As she sits despondent at home, her mother convinces her to apply for an advert in the paper. She is hired to catalogue Bluebell Castle's assets and determine if there is anything that has a hidden value that they might be able to sell. You see, the Baron Ludworth lost everything to a ponzi scheme just before his death and his son and heir, Arthur Ludworth, is trying to save the castle. This is an enjoyable, fun, contemporary romance with nobility, mystery, suspense, romance, financial ruin, family dynamics and second chances all interwoven into a delightful story. It also has historical elements as the diaries of ancestors, artifacts and works of art are searched to find something to save the castle and the family from ruin. There was a bit of Downton Abbey going through my mind as I read this story. The Ludworth triplets: Arthur, Tristan and Igraine (who prefers to be known as Iggy) welcome Lucie with open arms. They are a delightful family who wear their emotions on their sleeves. Their teasing, love of dogs, love of family, home and the village will warm your heart. The King Arthur legend plays a role in this story as well, but I will let the reader discover how on their own. The serious part of the story deals with unwary investors who have suffered, along with their families and the families of the fraudsters. The romance is sweet, even if it is quick. I loved seeing how both Arthur and Lucie tried to keep their distance, but the pull of love was too strong. With wrongful accusations, secrets, mysteries and romance this is an engaging start to a new series. I do not hesitate in recommending this story. The publisher generously provided me with a copy of this book upon my request. The rating, ideas and opinions shared are my own. Lucie leaves her job with a reputable company that specialises in fine art under a bit of a cloud. Shortly after she sees an advert (or rather her mum thrusts it under her face!) for a live-in archivist at the very grand Camland Castle; determined to try and put her controversial ending with her last firm to one side she applies and to her shock is swiftly appointed. Lucie takes solace at the castle and throws herself into work alongside triplets Arthur (Baronet Arthur Ludworth no less), Tristan and Iggy. There is a distinct love of Camelot with the names of all the characters from the castle! Lucie finds herself falling for Arthur who is much younger than she anticipated, but she is hiding not only the secret of her previous employment but also a dark family history that threatens to engulf her at times. The castle is under financial threat and Lucie is determined to go through every nook and cranny to assist the family with trying to find some valuable antiques or artwork to save them as she grows so fond of them all. Can she save the day...? I really enjoyed reading about the archive side of things, it is a new topic for me but my love of historic homes is real so this was of high interest to me. This is the first book in a series of 3 so I imagine the next 2 will focus on the other 2 siblings and if they are as entertaining and easy reading as this then I can't wait to read them! What a lovely contemporary novel about love, trust and second chances! Lucie is starting over again in a little, quit town Derbyshire. After a bad work experience at a prestigious art house, she left her home. Actually Lucie is running away to a place where nobody knows her or her past. From the first moment Lucie arrived, she knew, the job as a curator at the Bluebell Castle isn’t going to be a piece of cake. Arthur, the heir and her employer is not old and ugly, but young and very handsome. Luc What a lovely contemporary novel about love, trust and second chances! Lucie is starting over again in a little, quit town Derbyshire. After a bad work experience at a prestigious art house, she left her home. Actually Lucie is running away to a place where nobody knows her or her past. From the first moment Lucie arrived, she knew, the job as a curator at the Bluebell Castle isn’t going to be a piece of cake. Arthur, the heir and her employer is not old and ugly, but young and very handsome. Lucie doesn’t need love in her life, even fate isn’t unpredictable. Even though she will experience new feelings and everything is going to change. Arthur and Lucie can’t deny their attraction, but will that be enough? One day Lucie has discovered the treasure to save his family and the almost ruined castle, but is she brave enough to act? Will Arthur trust her and is a romance possible between these two different people? Spring Skies over Bluebell Castle is a charming feelgood-story with wonderful keyplayers, some humour, knights and art objects. It is indeed a bit predictable, but that doesn’t ruin the reading pleasure. When I closed the book I had a smile on my face and I am certainly going to read the next adventures of the family Ludworth. If you loved to be taken to the world of an old castle, a blooming romance with beautiful characters and a touch of mystery.. just read this book! A new series by best seller Sarah Bennett. This new series is called Bluebell castle and we start the series with this adorable book. Lucie is looking to escape the hectic Hubble bubble that is London life. Determined the leave the bright light city well and truely behind her. Lucie decides to move to Derbyshire to work at Bluebell castle. Having not met her new employee yet. Lucie believes that he will be an old man with graying hair, a long beard and wizarding magic. But what greats Lucie is a A new series by best seller Sarah Bennett. This new series is called Bluebell castle and we start the series with this adorable book. But what greats Lucie is anything but. Arthur Ludworth might just be the most handsome guy Lucie has set eyes on ever. Let’s just say images of love do not fill Lucie’s mind. But other unsavoury thoughts certainly do. Meaning that Arthur is going to be a huge major distraction. While Lucie gets on with her day to day job. She stumbles upon a painting. A painting that the family feared had been lost forever. Could this be the hidden piece of treasure that will save the castle and the family business? This is the first book in the Bluebell Castle series. This is also my first book by this author, but after reading this one I will definitely be going to find some more books by her. The two things that attracted me to this book was the beautiful cover with its blue skies, and also the name ‘Bluebell Castle’! It instantly filled my mind with wonderful images of stately homes surrounded by bluebells! In this story we meet Lucie. Leaving her London job as an art specialist in an auction house, Luci This is the first book in the Bluebell Castle series. This is also my first book by this author, but after reading this one I will definitely be going to find some more books by her. The two things that attracted me to this book was the beautiful cover with its blue skies, and also the name ‘Bluebell Castle’! It instantly filled my mind with wonderful images of stately homes surrounded by bluebells! In this story we meet Lucie. Leaving her London job as an art specialist in an auction house, Lucie heads to Derbyshire to take up the job of Archivist at Bluebell Castle. The Castle is under financial threat and Lucie works with the owners Arthur, Tristan and Iggy to search the Castle to find all the valuable family antiques and heirlooms to save them. Whilst working with them, Lucie falls helplessly in love with Arthur, but tries to maintain a professional relationship with him, which really doesn’t work very well!! This was a delightful story! Lucie was lovely and I did feel sorry for her at the beginning of the story when she runs into trouble at the auction house that she works in. Personally, I’d much rather work at some ancient castle in Derbyshire than some auction house in London so was really pleased when she decided to take the plunge and move there. I was drawn into Lucie’s story right from the beginning and when we meet the ‘Derbyshire’ characters, the story was just perfect!! It did make me chuckle with the King Arthur and Camelot connection and I thought it was wonderful that the family were all named after something to do with it! The triplets, Arthur, Tristan and Iggy were just wonderful and I have to agree with Lucie that Baron Arthur Ludworth did sound absolutely gorgeous! I thought the plot was original and well thought out and I loved the fact that Lucie’s job was an archivist! I was also insanely jealous at this as what could be better delving into a stately home’s past looking for old heirlooms! The chapters alternate between Lucie and Arthur’s point of view and it is such an addictive read that I found it difficult to put it down. The characters are all so likeable and it’s obvious how much it means to the Ludworth family to save the Castle from financial ruin. This is the second Sarah Bennett book that I have read and she does write such lovely and engaging stories. Lucie Kennington is an art expert, working for a prestigious auction house. But a mix up with a painting means that she finds herself under suspicion of fraud and she is suspended from her job. To make ends meet, she takes a position at Camland Castle, aka Bluebell Castle because of the beautiful flowers that come out aplenty every year. The new baronet of the castle is Sir Arthur Ludworth This is the second Sarah Bennett book that I have read and she does write such lovely and engaging stories. The new baronet of the castle is Sir Arthur Ludworth and Lucie finds out that everything connected with the place has an Arthurian connection. I thought this was a really lovely idea and where, in the wrong hands, it could have been a bit naff, in fact, being in the right hands, it worked really well. This is a romance and so you can perhaps get an idea of what might happen between the lovely Lucie and the gorgeous Arthur. Lucie has other demons in her past and so she finds it hard to give her all to Arthur and the castle but rest assured there are some delicious scenes between the two of them which made me smile and caused my heart to melt. The writing is light-hearted (just as you would expect with this genre) but still meaty enough to give depth to the story. I loved Arthur in particular and thought he was the perfect hero. He is one of triplets and I thought Tristan and Igraine were really well-drawn too. As this is the first of a trilogy I'm guessing the other two parts will focus on each of them as the main character. And here's the tiny downside for me. I felt Lucie and Arthur's story needed more of an ending. The ebook finished very unexpectedly at 94% when I was waiting for more of a conclusion. I presume though that their story will be followed up in the next two books, even if they are not the main focus, so I don't feel too bad. I know what I'm hoping for for Lucie and Arthur - let's just hope the author feels the same way! All in all, Spring Skies Over Bluebell Castle is a delightful romance, set in a beautiful and fascinating setting. It's a really easy and enjoyable read. This is the first book in the Bluebell Castle Series, book two – Sunshine Over Bluebell Castle and book three – Starlight over Bluebell Castle are out in July and November of this year. Quite a few generations of the Ludworth family have been named after characters from the Arthurian legend and the castle is filled with objects that are connected to this obsession. The upper echelon do have a reputation for being slightly eccentric, so I guess this is to be expected. When I had my first child I sc This is the first book in the Bluebell Castle Series, book two – Sunshine Over Bluebell Castle and book three – Starlight over Bluebell Castle are out in July and November of this year. When I had my first child I scoured through the complete works of Shakespeare for names, so I can totally get on board with Arthurian names. Perhaps not much fun for the child in question, but when you end up a Sir Arthur, as is the case in this family, then it’s worth the odd Uther, Morgana or even Pendragon. The Ludworth family is struggling to keep the family castle and grounds afloat, so they decide to get an art expert and historian to go through their vast collection to see if there is anything valuable they can sell to save their family home. Lucie Kennington is at a loose end after becoming unemployed unexpectedly. Her troubled and dark past is following her around like a bad smell and it might just be a question of time until it follows her all the way to the halls of Bluebell Castle. She doesn’t expect to find not one but two handsome men or a castle full of rescue dogs for that matter. It’s also fair to say that her reaction to the bouncy, yappy and often mud covered mutts is fairly important to at least one of the men. It’s a fun, warm-hearted and light read. A feel good read that doesn’t ask you to try and out-think the plot or dive into emotional upheaval. It just represents few hours of pleasant relaxation. By the way I want an invite, so I can explore the castle and secret tunnels. Just Saying. After being a huge fan of the Butterfly Cove and Lavender Bay Series’ I was thrilled to learn about a new series – Bluebell Castle. Even better was when I received the email from Rachel offering places on the book tour – I think I replied in about 30 seconds. As expected, Sarah Bennett creates a beautiful setting for her new series in the form of a castle set in acres of woodland and countryside. It’s owned by Authur Ludworth (Baronet) and his siblings Tristan and Iggy. Unfortunately they also ow After being a huge fan of the Butterfly Cove and Lavender Bay Series’ I was thrilled to learn about a new series – Bluebell Castle. Even better was when I received the email from Rachel offering places on the book tour – I think I replied in about 30 seconds. As expected, Sarah Bennett creates a beautiful setting for her new series in the form of a castle set in acres of woodland and countryside. It’s owned by Authur Ludworth (Baronet) and his siblings Tristan and Iggy. Unfortunately they also own the debts and bills left behind by their late father so bring in an art expert, Lucie Kennington, to catalogue and value any art that may help to pay the debts. Lucie Kennington has a family with a past and is currently dealing with her own issue from her previous employers. She finds herself falling for Authur but will her past catch up with her? Told from both persepctives (Lucie and Authur), this wonderful romance novel is perfect for for those wanting a light reading experience. It’s so hard to put this book down once you’ve started and the time just flies by. It’s perfect for sitting in the garden reading or snuggled up under a quilt (so you can pretend you’re in the old castle). Authur is a swoon-worthy character and Lucie is such a gentle soul and you are just rooting for them from the beginning. In addition to the romantic storyline I also became really involved into Lucie’s search around the castle and couldn’t put the book down until I know how the ‘work issue’ was going to be resolved. Sarah always writes books with such wonderful characters, settings and storylines and did not disappoint with her new series. But there is work to be done at this castle - answering the job advertisement for a curator to record all the artefacts held within Bluebell Castle. Lucie has visions of Arthur Ludworth the current Baronet as some old relic who is going to be as difficult as he is helpful. What Luci Lucie is on the run. On the run from something she did not actually do, but in the world of antiques, auction houses and reputation she needs to disappear for a while. Holed up in a castle seems a good as place as any. Arthur Ludworth, eldest of triplets by minutes is left the legacy of Bluebell Castle and all the bad investments and therefore debts that his father left behind. He knows that he needs to capture the idea of perhaps opening up his home to cash in on the Castle's history as well as its artefacts, but there is also talk of a missing painting which might explain the obsession that all Ludworths have had with Arthur, Lancelot and the Knights of the Round Table. Will Lucie's past catch up with her? Not up for me to tell you - go and read this wonderful new novel in the first of a new series from Sarah Bennett. Lucie Kennington is an art specialist at a prestigious art house in London. When her discovery of a lost piece from WWII turns out to be a fraud, she is suspended is accused of the fraud. While at home, the weight of the possibility of losing the job she loves and the connection to her family past causes her to hide under the covers for a while. I know I would want to hide too! Her mom gets her out of bed and shows her an advert for an art specialist at a castle in the Derbyshire countryside tha Lucie Kennington is an art specialist at a prestigious art house in London. When her discovery of a lost piece from WWII turns out to be a fraud, she is suspended is accused of the fraud. While at home, the weight of the possibility of losing the job she loves and the connection to her family past causes her to hide under the covers for a while. I know I would want to hide too! Her mom gets her out of bed and shows her an advert for an art specialist at a castle in the Derbyshire countryside that looks like a great opportunity for her daughter to get back to the work she really loves. Lucie accepts and is off for a fresh start outside of all her troubles in London. Go girl! Have fun storming the castle!!! When she gets to the castle, she meets with her new employer and the rest of his family; Arthur Ludworth, his twin brother Tristan, triplet Igraine (Iggy), great-aunt Morgana, and uncle Lancelot. Sparks fly when Lucie meets Arthur and it fuels the already engaging adventure Lucie embarks upon while cataloging the castle’s contents for personal and material treasures. I really enjoyed this book! This is the first contemporary romance I’ve read in a long time. I was drawn into the story, the characters and the overall themes of fresh start and redemption. This is the first of a trilogy, so I am itching to get to the next books when they come out. This is also my first introduction to the author, so I am eager to read more of Sarah Bennett. Although I didn’t read this beautiful story in one sitting I was still captivated by every single page! We meet Lucie who is having a bit of bother in her life which leads her to apply for a job at the grand Bluebell Castle. These events lead us to meet the gorgeous baronet Arthur Ludworth and his siblings Tristan and Iggy, among other quaint characters such as Lancelot and Mrs W. I adored the setting of Bluebell Castle as it made me feel like I was transported to a different period of time when Although I didn’t read this beautiful story in one sitting I was still captivated by every single page! We meet Lucie who is having a bit of bother in her life which leads her to apply for a job at the grand Bluebell Castle. These events lead us to meet the gorgeous baronet Arthur Ludworth and his siblings Tristan and Iggy, among other quaint characters such as Lancelot and Mrs W. I adored the setting of Bluebell Castle as it made me feel like I was transported to a different period of time when discovering the history of the castle and the estate. What a super read! Best news of all is that's it's the first in a new series. Lucie needs to get out of London and a short-term contract living in a real castle seems like the ideal escape. Certain that she will find her new employer to be an older gentleman of the aristocracy, she is shocked to be faced by a contemporary, Arthur - or should that be Sir Arthur to her? Having inherited the title but not the wealth to keep the estate going, the family are hoping that Lucie will discover some long What a super read! Best news of all is that's it's the first in a new series. Lucie needs to get out of London and a short-term contract living in a real castle seems like the ideal escape. Certain that she will find her new employer to be an older gentleman of the aristocracy, she is shocked to be faced by a contemporary, Arthur - or should that be Sir Arthur to her? Having inherited the title but not the wealth to keep the estate going, the family are hoping that Lucie will discover some long hidden treasure to balance the family coffers. She quickly gets on with the job in hand, but finds herself ever distracted by the very handsome Arthur . . .
My Review 4.5 stars Art, Castles, Love and Spring what is not to love ! I knew I would love this book as soon as Rachel's Random Resources invited me to join the Blog tour. Thank you Rachel for the gifted copy of the book in return for a fair and honest review. I instantly liked the characters and empathised with Lucie with the loss of her father and his hidden past. I quickly felt part of the family at Bluebell Castle and I loved the strong relationship between the siblings as one of three ch My Review 4.5 stars Art, Castles, Love and Spring what is not to love ! I instantly liked the characters and empathised with Lucie with the loss of her father and his hidden past. I quickly felt part of the family at Bluebell Castle and I loved the strong relationship between the siblings as one of three children I could resonate with this. I really hoped that Arthur and his family found a solution to their financial issues as they were a very likeable bunch. I loved how the story developed and particularly the mystery of Eudora and Thomas which gave the book an extra dimension and I love the Pre-Raphelite connection as they are a particular favourite of mine. It was a lovely joyful and comforting read that I enjoyed from beginning to end, and I didn't want it to finish. I really enjoyed meeting the Ludworths and of course Lucie. Lucie was such a heartwarming and relatable character. The story of her past and her relationship with her mother really pulled on my heart strings. We meet Lucie as she is being suspended from her job for an instance she has nothing to do with. Lucie's mother pulls her out of a fun by showing her an add in the local paper looking for an appraiser to come do inventory and investigate some pieces in a castle. (Who doesn't want a paid adve I really enjoyed meeting the Ludworths and of course Lucie. Lucie was such a heartwarming and relatable character. The story of her past and her relationship with her mother really pulled on my heart strings. We meet Lucie as she is being suspended from her job for an instance she has nothing to do with. Lucie's mother pulls her out of a fun by showing her an add in the local paper looking for an appraiser to come do inventory and investigate some pieces in a castle. (Who doesn't want a paid adventure in a castle?!). This is how Lucie meets dear Arthur and his triplets Iggy and Tristan. I loved all the Ludworth characters. The drops of mystery mixed with the budding romance between Lucie and Arthur really draw a reader in. The wit and humor were not lacking either making this an overall enjoyable novel! I will definitely be reading the rest of the series and more by Sarah Bennett! I have to say I really got sucked into this book from the start! It is a great, easy compelling read and I really enjoyed getting to know both Lucie and Arthur! Now I don’t think I have read a book that contains an actual castle in a very long time, and it was great to have the descriptions and history around the castle as well as the romance that comes into play. I also reall Thank you to the author and Rachel’s Random Resources for providing me with a free copy in exchange for an honest review. Includes a heated scene or two (perceived or otherwise) but I didn't find it objectionable. Overall, a fun little book to escape in with likeable characters, a bit of mystery and drama, and of course, the whimsical romance. I enjoyed it. I can honestly say I judged a book by it's cover here, and expected a light easy story that I’d forget in a months time. It is easy to read, but in a way that’s delightful and interesting. The characters that live in the castle have personality and gumption, and throughout the story you keep crossing your fingers hoping for the best. The writing and plot were realistic and I felt like I was really there, a I voluntarily read and reviewed an ARC of this book. All thoughts and opinions are my own. The strength of a good book in this genre are in its character depictions and the amount of attachment we can form with them given the time we have once they are introduced to us. This is a trilogy with a trio of triplets as the main leads. First up we have the new Baron Ludworth. The second eldest of the three but the eldest male is now heir to a rambling castle and a sizable cash flow problem. He is heartbroken over his father's death but is putting together as stable a plan as possible with th The strength of a good book in this genre are in its character depictions and the amount of attachment we can form with them given the time we have once they are introduced to us. This is a trilogy with a trio of triplets as the main leads. First up we have the new Baron Ludworth. The second eldest of the three but the eldest male is now heir to a rambling castle and a sizable cash flow problem. He is heartbroken over his father's death but is putting together as stable a plan as possible with the help of his siblings. This relationship as well as all the others that we are to encounter are so heartfelt (and I do not say this lightly) that I felt warmed by them and it has left me itching to find out what happens with the other two siblings as soon as I can. Lucie is the female lead, a woman who has some things in her past that she would rather not recollect but overall an enthusiastic worker who specializes in valuable art. When their paths cross in the time when both need bolstering, and all the numerous dogs in the background, things get better for both of them. I cheered for them as well as shed a tear or two, overall a very enjoyable read. I enthusiastically recommend this to readers of this genre. Recently I have not clicked with books in this variety because of one reason or the other, the predominant reason being the narration. This particular tale has made me feel fresh and hopeful that there are authors out there I can still personally recommend(not that the others are bad but I can only recommend something I actually had good experiences with). Found this very hard to put down, the book grabs you straight away. There's characters that you hate others you love, this is a sign of a great book along with involving your emotions. The characters are very life like and you can certainly build up a mental picture of how they look. If you've not read any of Sarah's books before why not!? I LOVED how this book was set out, I’m not usually a mushy book reader but Sarah Bennett awakens the girly girl in me with her books and this one didn’t disappoint! A fun loving book (with a sprinkle of naughtiness) that can be picked up and put down or devoured in one go. Book 1 of a series of 3, you know it’s going to be a book for each Ludworth, I can’t wait to see what Sarah has planned for Tristan and Iggy. Born and raised in a military family, she is happily married to her own Officer (who is sometimes even A Gentleman). Home is wherever he lays his hat, and lif Sarah Bennett has been reading for as long as she can remember. Raised in a family of bookworms, her love affair with books of all genres has culminated in the ultimate Happy Ever After – getting to write her own stories to share with others.